Concerns have been expressed about a bonfire in the republican New Lodge area of north Belfast. It is placed close to several large blocks of flats, a children's nursery and a number of homes. 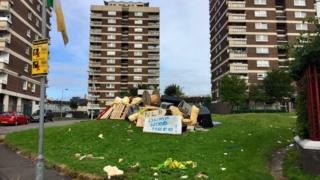 Sinn Féin councillor JJ Magee said he had spoken to a number of residents who had asked him to get the materials moved. He said the bonfire had been constructed by a small number of youths aged between 16 and 18 years of age. Mr Magee told BBC's Good Morning Ulster programme that the children involved "see the fun but don't realise the dangers in it". "This bonfire's taking place against the wishes of the community, it's a small element within the community that on a yearly basis collect this wood," he said. He said that in the aftermath of the Eleventh Night bonfire at Wellwood Street in Sandy Row, some New Lodge residents are now worried that their homes could catch on fire. On 11 July, bonfires are traditionally lit in many loyalist areas to mark the start of the annual commemoration of William of Orange's victory over King James II at the Battle of the Boyne in 1690. In August, anti-internment bonfires are lit in some republican areas to commemorate the introduction of internment without trial of republican suspects, which was brought in by the British government in 1971. The New Lodge bonfire is due to be lit on the evening of 8 August. Mr Magee said he would be working alongside the community and statutory agencies to try and ensure that the bonfire would not go ahead. "It is important that people of the New Lodge are able to live their lives in peace and calm without this on their doorsteps," he added. "Youth leaders in the area are trying to encourage these young people not to engage in anti-social behaviour, and to do other things to help people in the community rather than bring this misery to them." A Housing Executive spokesperson said it was working closely with the community of the New Lodge area. "Due to health and safety concerns and with community support, we have regularly removed materials from this site and will continue to do so," it added.